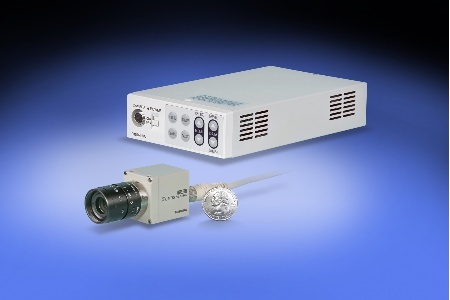 Toshiba Imaging Systems Division (ISD), a division of Toshiba America Information Systems, Inc., and leading manufacturer of ultra-compact high definition (HD) and high resolution CCD and CMOS video cameras, introduces the IK-HD3H, an ultra-small, 2.1 megapixel,1080p 3-chip CMOSHDvideo camera. The new, feature-rich camera is the first in a series of two CMOS remote-headHD cameras, both interchangeable with Toshiba Imaging’s new IK-HD3D controller.With1920 x 1080 digital DVI, 59.94Hz output, the compact IK-HD3H camera delivers up to 1,000 TV lines resolution. The camera’s unprecedented user controls offer an expanded range of adjustments for precise color control, high resolution, increased sensitivity and advanced noise reduction technology. Other features include a binning mode providing a 4X increase in sensitivity without increased noise, image flip and mirror, a gen lock for 3D and multi-camera setups, and selectable output modes between 1080i and 1080p.The RS232 remote control function combines with a convenient C-mount lens mount making the IK-HD3D video camera ideal for sophisticated and diverse imaging applications, such as surgical microscopy, endoscopy, aerospace, and industrial video applications. Thetwo piece, 2.1 megapixelcamerasystem is easy to integrate into new or existing applicationsthat require1080p, 59.94 Hz output and superior color imaging with sharp contrast. Toshiba Imaging’sIK-HD3H remote-head camera is optimal for 3D imaging tasks, microscopy, scientific imaging, diagnostics, specialty broadcast, and other applications where exceptional video performance, increased sensitivity, and small package size is required.For more information about Toshiba Imaging’s high-resolution, HD color video technology and products. Toshiba America Information Systems, Inc. (TAIS), Imaging Systems Division (Irvine, CA), is one of the three business units of TAIS and is world renowned for its ultra-compact, superior color and contrast, high definition (HD) 3CCD cameras. More affordable CMOS hi-def video systems are also available and both camera suites are accompanied byToshiba’s legendary and comprehensive tech support. Toshiba’s Imaging Systems Division provides imaging products for the security, medical, scientific and manufacturing markets. TAIS is an independent operating company owned by Toshiba America, Inc., a subsidiary of Toshiba Corporation. For more information, visit www.toshibacameras.com. Toshiba Corporation is a world-leading diversified manufacturer, solutions provider and marketer of advanced electronic and electrical products and systems. Toshiba Group brings innovation and imagination to a wide range of businesses: digital products, including LCD TVs, notebook PCs, retail solutions and MFPs; electronic devices, including semiconductors, storage products and materials; industrial and social infrastructure systems, including power generation systems, smart community solutions, medical systems and escalators & elevators; and home appliances. Toshiba was founded in 1875, and today operates a global network of more than 590 consolidated companies, with 206,000 employees worldwide and annual sales surpassing 5.8 trillion yen (US$61B). For more information, visit www.toshiba.co.jp/index.htm.